So that’s good news I guess. In other news, I finally got around to ordering a vegan cook book. 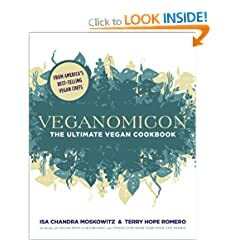 After looking around on the internet for what could be the best one, I chose Veganomicon: The Ultimate Vegan Cookbook since it’s been reviewed as one of the most complete and comprehensive ones. One review I found was from Ex-Foodie , who seems to really love the book and tried out several of the recipes. So I am excited for it to arrive soon now.